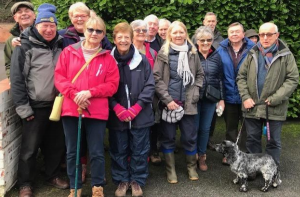 On Friday 28th December a party of nineteen Rotarians and their partners walked for approximately two and a half miles along the Staffs and Worcs canal in the direction of Cookley and then back to the Island Pool Pub via the centre of Cookley. fellowship and conversation was excellent and the walkers enjoyed the mild, dry late December weather. The walkers consisted of Gail Bedford, Michael and Rosie Evers, Chris Fonteyn, Malcolm and Sally Frost, Laurie and Clare Latham, Roger and Judy Perry, John and Christine Rostron, John and Hilary Savage, Fred and Janet Shaw, Trevor and Rita Sidaway and Richard Wynne. Several other club members joined the walkers for a pleasant lunch afterwards at the Island Pool Pub.